Two years have past since I installed two 2TB disks on my home server. 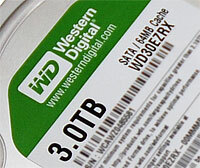 Last week I squeezed out the remaining bytes of my data volume, so I ordered two brand new 3TB Western Digital harddisks (WD30EZRX) to replace the current 2TB ones. Two things prevented an upgrade as easy as the previous one. First I wanted to do a clean install of Debian 7.1 “Wheezy” and secondly wanted to switch to UEFI boot and GPT, so I had to create a new partition table and a new EFI boot partition. Hope another two years will pass before I need to go through the process again.